We all know how much taxes can be a pain for a small business owner, with calculating everything, and making sure you have been recording everything properly. Tax season is almost always quite hectic, and often times you actually miss something, especially if your records weren’t perfect. Chances are, that thing you missed was a deduction on your taxable incomes too. This is especially common for someone that is just starting a business or runs a smaller business and might not be able to have a whole financial department. Don’t worry though, as long as you are at least including some deductions you are good, because there is always something you can deduct, even if it isn’t that much. Remember, before you deduct anything though, check the tax law around it, because there are always rules and sometimes some false rules get spread around through word of mouth on the internet, and you don’t want to end up being audited because of one deduction you thought you could do. To get you started in making sure you are covering simple areas though, here are some basics that almost any small business can take advantage of. This one had gotten a bit famous because of people claiming a Hummer they bought under a business expense and deducting it. While you can’t deduct a Hummer (in most cases), many things fall under the supplies and equipment section, including computers and phones used specifically and only for business purposes. If you want more information about what you can and can’t deduct in this category, there is an entire site devoted to the Section 179 deductions, which includes vehicles, software, hardware and properties. 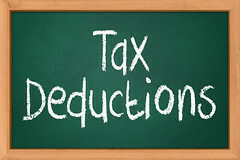 Most people are usually aware that they can deduct things that have gone toward a non-profit company in the form of a charitable donation, which requires you to fill out a 1040 Form, but what many don’t know is that as a business you are allowed to deduct gifts toward employees and clients up to $25 dollars for each individual client or person. There are a lot of things in traveling that can fall under a tax deduction, but essentially if you travel for your business, regardless of what you travel in, the expenses of that travel can be paid for. If you drive a car for both personal and business related areas then you would split the deduction based on the mileage (or a flat rate that is almost always less than if you keep track of your mileage). The standard rate for 2013 is at 56 cents per mile roughly, but it tends to change yearly. Mileage with a car is not the only travel deduction though, any flights, trains or even hotels can be deducted so long as they are for business. This doesn’t mean you can’t take a non-employee or client with you as well, just that you can’t deduct any of their costs. Rental cars and tips are also included. One of the bigger ones that goes unnoticed, even though they are more common to be something you’d keep track of and keep receipts of, is the meals you have while on business trips, or even just a meal with a client in general. However, they are only deductible up to 50% of the expense. But if you are frequently meeting with clients for your job (especially self-employed people) this is well worth it and a rather easy one to deduct. Entertainment also falls under this category with a 50% expense deduction; however they are stricter with what qualifies in the entertainment category as it must be related to the reason of business. You can find more information on both food and entertainment expenses with Publication 463. This is just a small touch of the things you can get deducted with your business. There are plenty of others, including things like insurance premiums (especially with the recent affordable care act), social security, advertising, legal fees, retirement contributions, telephone use and the one that always gets everyone you can deduct what you paid for state taxes on your federal taxes. And don’t forget, you need to hold onto receipts for any of these deductions, otherwise you can’t prove it was bought. Is Incorporation the Best Choice For a Small Business Startup?